It’s a good idea to write down everything you eat and drink, including amounts, for at least a week. After the week is done, you can now identify exactly how and why you tend to gain weight. Further, once you see everything you consume in a week’s time, you are more prone to pass on something you eat in the future as you now better understand how it may effect you waistline. Keep updating your journal daily while trying to replace some the high caloric foods with better, more healthy alternatives. Reduce the portion size of each of your meals. But don’t forget to eat foods that will satisfy your hunger or else it will feel like your starving yourself. In between meals, always try to have a snack…a healthy snack! Try not to allow yourself to get too hungry and only eat until you are satisfied. Walk as often as possible. If you need to go to the store and it’s ‘walkable’, then walk! If you need to make more then one trip and you have the time, so be it. Walking is a wonderful way to get the heart pumping and blood flowing and pounds shedding. Especially if you walk at a quick pace. Walking is only the begining, though. You will need to set-up a daily exercise routine. In fact, vary the daily routine to keep it interesting and more effective. The goal is to break a sweat. Leisurely exercise does very little to help you burn off the fat so get moving! Don’t set out to lose fifty pounds on day one. Setting unreasonable goals will doom your efforts. First, simply set out to stop gaining weight. 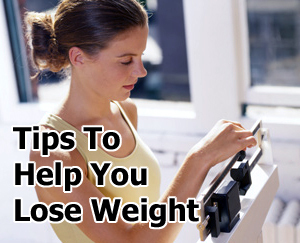 Once you have controlled your weight gain, start shedding pounds gradually. By losing small amounts of weight with a smart plan, over time you will begin to notice the results. Your weight fluctuates daily. You can gain or lose a pound here or there everyday. So if you weigh in everyday, you will drive yourself nuts and begin to get frustrated. Jump on the scale every month and you will see the change you desire. But don’t get discouraged if the loss is not what you had hoped. Simply adjust your plan and keep going. The only people who fail to lose weight are those who quit trying.